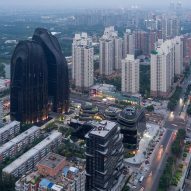 These images taken by Dutch photographer Iwan Baan capture the mountainous forms of MAD's new Beijing skyscraper complex against a humid August sky. 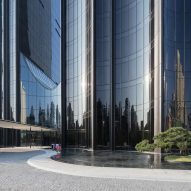 Baan's photographs show the 10 rounded structures that make up the 220,000-square-metre Chaoyang Park Plaza – completed by MAD earlier this year – juxtaposed with a skyli ne dominated by boxy tower blocks. The photographer, who is the go-to for many of architecture's biggest names, was invited to shoot the project in late summer. 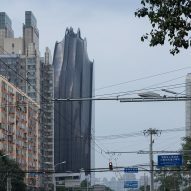 Atmospheric conditions meant the glazed, ridged forms of the towers appeared opaque and looming like a mountain range. 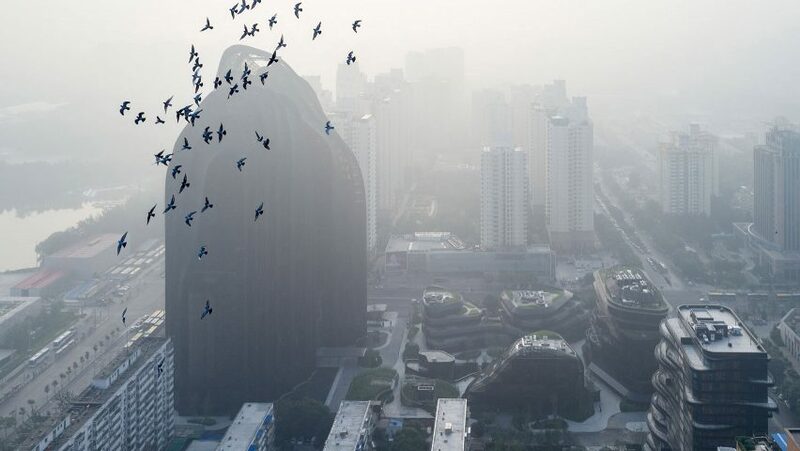 "Iwan Baan visited Beijing in early August, when the summer heat and humid climate left a heaviness in the air – one that could be seen and felt," said MAD. 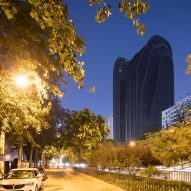 "Over the course of the days he was scheduled to shoot Chaoyang Park Plaza, he was dealt less than ideal photographic conditions. 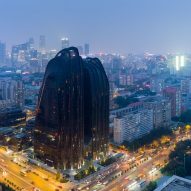 But, this is real Beijing, and it offered Iwan Baan the opportunity to photograph MAD's latest project in its truest environment." "With the grey atmosphere looming, Iwan Baan was able to capture our project in a way that evokes a different mood," added the studio. 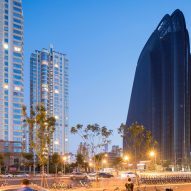 "In his images, Chaoyang Park Plaza, even with its soft, organic lines, and poetic silhouette, offer a very strong visual contrast to its surrounding urban setting." 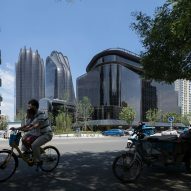 The complex is located on the southern edge of Chaoyang Park, which MAD likens to Manhattan's Central Park. It forms part of the city's central business district. 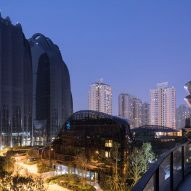 The firm wanted Chaoyang Park Plaza to act as a transition between the park and the dense urban fabric. "We want to blur the boundary between nature and the artificial, and make it so that both are designed with the other in mind," said MAD's founder Ma Yansong. "Then, the argument in the modern logic of humans to protect or to destroy nature will no longer exist if we understand and see humans and nature as co-existing. Human behavior and emotion is part of nature, and nature is where that originates and ends." The forms are derived from the mountains depicted in traditional Chinese ink landscape paintings. 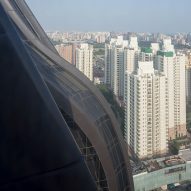 Two skyscrapers – one rising to 120 metres – are set nearest the park, while eight smaller blocks sit on the other side. 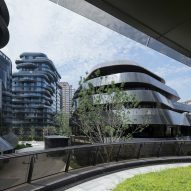 Two of the smaller buildings house an Armani-branded apartment complex, featuring staggered balconies that overlook landscaping in the centre of the complex. Pine trees, bamboo shoots and rocks and ponds help to reinforce the connection with the park beyond. 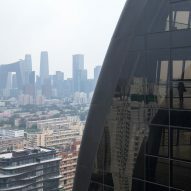 The doughnut-shaped headquarters of Chinese broadcaster Phoenix Television can be spotted in the background of the photographs, alongside OMA's CCTV building. "The small-scale, low-rise commercial buildings appear as mountain rocks that have endured long-term erosion," said the studio. "We have the opportunity to try and create a different kind of city, that on a spiritual and cultural level, can be compared to the classical cities like Beijing, that are of Eastern philosophy and wisdom," added Ma. Ma has been outspoken about his belief that Chinese architects need to develop a uniquely Chinese style, and recently spoke to Dezeen about how architects need to develop visionary ideas for the future. The skyscraper complex is one of 10 on Dezeen's roundup of the best skyscrapers of 2017. Photographs of the project, which broke ground in 2014, first started emerging in early summer. Photographer Edmon Leong offered a first look at the project back in May and, in September, Khoo Guo Jie visited the site to offer a sneak peek. This year MAD also completed work on a cluster of housing towers in China's Anhui province, which also take their form from mountains.